Designed by the famed Laise Adzer, this ultra-wild jacket is virtually branded with her name! This gorgeous cocoon jacket is at once contemporary and evocative of traditional North African garments with exquisite ethnic details. It features trapunto-decorated bands, single-button closure, comfortable elastic cuffs and one crazy flattering hemline! 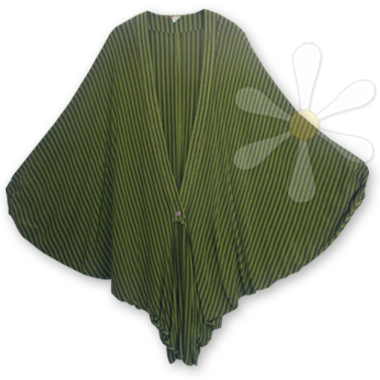 This one is in our earthy OLIVE dyed over the lighter version of our woven djellaba stripes. Gorgeous! The unique design will make you feel like you're in a Moroccan marketplace, a renaissance faire, or some wild Arabian tale spun by Scheherazade! You're a goddess... live like one, every day.